This is book 2 in the Highlander Defender series. When Charlotte Hill sees Hugh MacIain for the first time, he is brought to the infirmary almost dead. Having spent nearly two years in Fort William's prison, he has not gotten the proper care for himself. Knowing that the fort's doctor won't do anything to help Hugh, Charlotte sneaks in after he leaves to nurse the highlander. She never expected to feel such an attraction for a stranger. Hugh is instantly attracted to the woman tending him, but when he learns that she is the commanding officer's daughter, he knows that nothing can come of it. After he escapes, he can't stop thinking about Charlotte and decides that she worth fighting for. 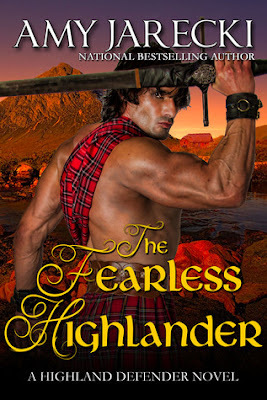 Can this Highlander win over the Englishwoman's heart? I enjoyed this story! Who don't love a brawny highlander trying to win a ladies heart? Not I, that is for sure! I really liked Charlotte and Hugh. They knew that they would encounter problems if they chose to be together, but decided that their love was worth the price that they would have to pay. With Hugh being a Jacobite and Charlotte being the daughter of a high ranking English officer, there were plenty of obstacles in their way to that HEA. I'm looking forward to Jarecki's next book in the series, The Valiant Highlander.